Rely on the experts at Ford Collision Center in Tallmadge, Ohio, for top-of-the-line auto bodywork and collision repairs. 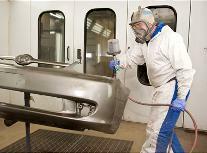 We are fully insured, bonded, and certified in paint and auto body repairs. Call us today at (330) 633-6222 to get the best auto bodywork in the area. 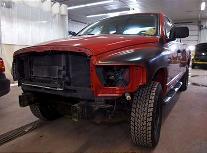 We are located inside the "Park Ford Building;" just ask for the body shop or collision center. --Computer color mixing for accurate color match. "Free" estimates on vehicles 10 years new or newer. "Free" assistance with car rental scheduling. Our shop will repair all makes and models, from framework to uni body repairs. Computer color matching is available, and we will work with "all" insurance companies even though we are "not" a direct repair repair facility for any of the them. Direct repair shops are much more dictated by the insurance company's. We prefer to keep the CUSTOMER our boss. When the insurance company allows, we will also assist in scheduling you a rental car. When you arrive for an estimate, if need be, we will wash the area of damage, give your vehicle a most thorough inspection to help minimize the need for a re-inspection from the insurance company which minimizes "down time". Also, with you providing us some insurance information, with claim number and fax number if possible, we will make sure the insurance company gets an estimate copy instantaneously. Also, if in the event a couple of pictures need "E" mailed to an insurance claims office, we offer that service as well free of charge. Contact us today to ask about our limited lifetime warranty. With over 50 combined years working together in the Akron Ohio area at FORD COLLISION CENTER, our owner and manager pride themselves in their final product. Doug's father owned his own shops and appraisal company his entire life and that's what lead Doug into this industry. He started this shop in June of 1984, then hired his manager Dennis in October of 1985, and they have been serving the area ever since. (330) 633-6222 for Expert Collision Repairs.